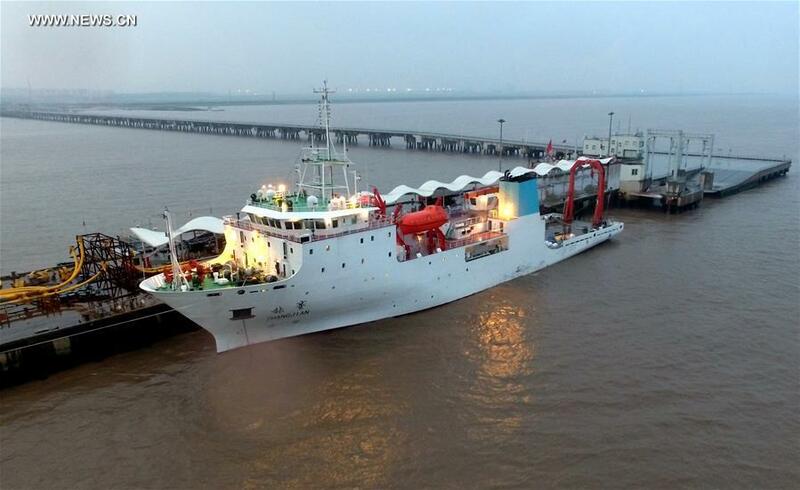 Chinese deep-sea explorer ship Zhang Jian has set sail from Shanghai to the Southern Pacific for scientific research. The vessel is the mother ship of Rainbow Fish, a submersible capable of diving to 11,000 meters, which Chinese researchers are preparing to send to the Mariana Trench late this year or early next year, said Fang Jiasong, chief scientist of the mission. During Zhang Jian's two-month journey to the Southern Pacific, scientists will test the navigation abilities of the ship and its scientific equipment, said Fang. The ship is carrying the landing device for the Rainbow Fish submersible. Its destination is the waters near the New Britain Trench, which is more than 8,000 meters deep in the Solomon Sea near Papua New Guinea. "Zhang Jian is China's first ship specially designed and built for deep-sea exploration. The journey is an important step in our efforts to take on the Mariana Trench," said Fang. Sixteen scientists from China and Papua New Guinea will work on board the ship and take part in exploration of the trench, which is about 750 kilometers long, with its deepest point measuring 8,320 meters. "We will study the terrain of the trench, take samples of seawater, sediment and explore the bio-diversity, and increase our understanding of the Earth's deepest water," Fang explained. Zhang Jian, named after the founder of Shanghai Ocean University, is 97 meters long and 17.8 meters wide. It has a designed displacement of around 4,800 tonnes and an endurance of 15,000 nautical miles. It will be used for general ocean expeditions, deep-sea engineering, rescue and salvage, underwater archaeology and film shooting. China began developing Rainbow Fish in 2014. It will be able to go much deeper than the Jiaolong submersible, which set a Chinese record for manned diving when it reached 7,062 meters in the Mariana Trench in June 2012. With a combined area larger than the United States, the world's 26 hadal trenches, defined as those with depths of 6,500 meters or more, are home to many unknown species as well as energy and metal resources. Exploration at these depths has been held back by difficulties including high pressure and low temperatures.